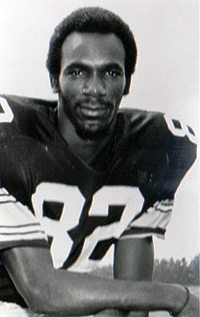 Together with the option year, Ham’s current contract with the Steelers will take him through the 1976 season. That would mean he wouldn’t be available to the rival league until 1977, the same time that Frenchy Fuqua intended to move to the WFL. In an attempt to keep Ham in Pittsburgh, the Steelers had met with Rudoy the previous week. It was Rudoy who had instigated the negotiations with the new league. Ham added he was reluctant to leave Pittsburgh, “There’s no question about that. I’m from Johnstown and I went to Penn State. I’d like to stay here. But this is something I have to consider.” Philadelphia and New York were considered the likely candidate for Ham's services. Rich Fowlkes was working as a security guard in Las Vegas when he attracted the attention of two Stardust Hotel officials while playing for a semi-pro team, the Las Vegas Casinos. Milton Jaffe, a former Pittsburgher and manager of boxer Billy Conn, telephoned Art Rooney and recommended Rich for a tryout with the Steelers. The only previous player to made the leap from the sandlot or semi-pro to pro football was Johnny Unitas. Unitas was 22 when he made it with the Baltimore Colts after the Steelers had passed on him. Fowlkes is 28 and doesn’t have the collegiate football background Unitas had. Noll was realistic with his observation that Fowlkes would find it tough to beat out Joe Greene, Tom Keating and Steve Furness plus rookie Charles Davis. At 248 pounds, Fowlkes had only lost half a pound while in camp despite an all out effort to make the team. He played cornerback at Oregon Tech for one year before an “I-don’t-give-a-dam” period in his life. He just drifted before meeting a girl who encouraged him to seek better things in his life and pick up his football career. Having heard about the tough semi-pro league in Vegas, Fowlkes decided to try and make it there and as a consequent was now in the Steelers training camp trying to make the pros. Saturday 27th July saw the first game of the exhibition season played when St. Louis beat Buffalo in the Hall of Fame Game. Almost a month into the strike and with the negotiations still dormant, reality returned to the NFL with the players and owners agreeing to resume talks on Tuesday July 30th under the supervision of the top federal mediator W.J. Usery Jr. Director of the Federal Mediation and Conciliation Service, Usery confirmed he would take personal charge of the talks. With the Steelers first exhibition game due in a week, coach Noll was still working out what players he would use. With a final short scrimmage scheduled for Sunday, the workout should decide his starting lineout with the quarterback, running back and linebacker positions proving to be the most competitive spots. With no veterans to call on, the Pittsburgh Post-Gazette projected the quarterback slot as a battle between Frank Kolch and Leo Gasiencia. “Leo has a good arm,” said Noll. “He’s picked up our system well. He’s a bright kid.” As a free agent, Gasiencia had tried out with the Giants in 1973 before going to West Chester in the Atlantic Coast League. The rookies given the best chance to start against the Saints were center Mike Webster, left guard Rich Druschel, right guard Jerone Hodges, left tackle Dave Reavis (’73 draft pick) right tackle Allen Sitterle. On defense, linebacker spots were obviously headed by Jack Lambert and Mark Gefert with Jim Allen at right cornerback and Bruce Henley at left cornerback. The 38-play scrimmage played on the Sunday saw Gasiencia complete six of eight passes for 65 yards with Quincey Daniels had the longest run of 42 yards. Nate Hawkins caught three passes for 48 yards. The Monday before the contract talks resumed saw the Steeler strikers’ solidarity begin to crack. 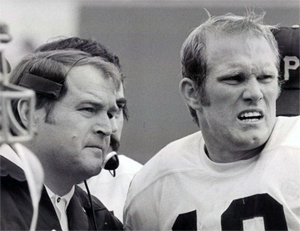 Noll’s fears regarding his quarterback would have faded when Joe Gilliam (pictured left) entered camp with safety Dennis Meyer. They joined receivers Barry Pearson, Glenn Scolnik, Dave Davis and defensive end Craig Hanneman who returned to the team the previous evening. Defensive tackle Steve Furness also crossed the picket line Monday evening. While those indications of capitulation were being signalled, the other veterans held a team meeting at the Hilton Hotel for an update from their representative, Preston Pearson. He said he would also contact all the out of town Steelers by telephone to inform them of the developments. With a quarterback controversy already in the offing between Gilliam, Terry Hanratty and Terry Bradshaw, Gilliam was probably hoping to get a head start by going into camp early, although he denied it. “That didn’t figure in my decision at all. Before Bradshaw managed to seal his position as the Steelers number one and bring the city four Super Bowls, the usual Pittsburgh quarterback controversy was always simmering just below the surface. Bradshaw told the Pittsburgh Post-Gazette that he had been wavering all summer about what to do if there was a strike. Gilliam was joining close to 250 veterans, approximately a quarter of them starters, who had entered training camps across the United States. 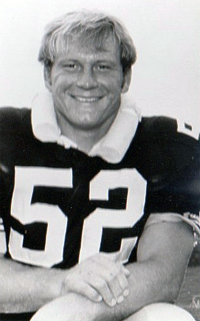 Because of injuries to Bradshaw and Hanratty in 1973, Gilliam played in five games that season and as with every training camp, starting positions were always open to competition. To complement the riches at their quarterback position, the Steelers’ number one draft choice, Lynn Swann, was showing the potential in camp that was expected when they Steelers drafted him. As ticket sales for the weekend’s exhibition games dragged, Federal mediator W.J. Usery, was struggling to reconcile the two factions. Although Usery said that substantive issues had been discussed, the two sides were still miles apart. AP reported that Usery’s goal was to get each side to submit to arbitration. At the end of July, three more veterans crossed the picket line. Offensive tackle Gordon Gravelle, linebacker Ed Bradley and running back Ernie Holmes went into camp. “When we started this strike,” Mansfield added, “we were all going to stick together. Now I don’t know. I have this feeling that in a little while there may be only four or five of us left, dying on the outside. It was reported that several players tried to dissuade Clack from going into camp with the argument that at 235 pound, Webster was too small to succeed as a center in the NFL. With several more days of training behind them, other starting positions were slowly being inked in. Leo Gasienica would open as quarterback with Joe Gilliam as backup. The Steelers were four point favourites. The smallest crowd to watch a professional football game in RFK stadium, 16,403, watch the beginning of a new era in Washington when Joe Theismann made his first start for the Redskins. New England won 21-16. As the players strike carried over into August, the negotiations between the union and the owners had still not made any advance. Although substantive discussions had taken place, it was reported that Federal mediator U.J. Usery’s goal was to get each side to submit to arbitration. Against a background of industrial strife, the Steelers’ organisation was preparing for the exhibition season with a limited amount of seasoned talent to sift through. Rookie Mike Webster had made an impact in training camp and was projected to be the starting center. Mansfield added, ““When we started this strike, we were all going to stick together. Now I don’t know. I have this feeling that in a little while there may be only four or five of us left, dying on the outside. Clack was petitioned by his striking teammates not to go in on the basis that at 235 pounds, Webster was too small to succeed as a center in the NFL. Despite Joe Gilliam’s entry into camp, it was thought Leo Gasienica would open at quarterback using Gilliam as backup. Las Vegas made the Steelers four points favourites. Before the first full weekend of exhibition games, the two adversaries were still trading blows with no end of the strike in sight. The Management Council accused the players of being uncompromising in their demands suggesting the two sides were $3 million apart. For the players, Bill Curry, said his group had made substantial changes in its bargaining demands, adding the owners had not increased their offer by one cent during the past three days and were continuing to attempt to bust the union. Curry said that, “despite all the pressures and all that has been brought to bear on the players, the union’s response to the strike had been phenomenal, confirming that 1,183 players were on strike. The Management Council counted by saying 300 veterans were now in camp while mediator Usery confirmed he couldn’t see an agreement being reached. 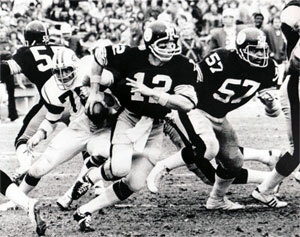 With veteran Joe Gilliam at the helm, the Steelers overcame the Saints in their first exhibition game. Using 48 of the 50 players available to him, coach Noll would have been satisfied with his team’s trip to New Orleans, returning to Pittsburgh with a 26-7 victory under their belt. Receivers John Stallworth and Lynn Swann were the stars while Gilliam took full advantage of the opportunity offered completing 11 of 19 for 158 yards. The Steelers had problems with the new hold-fast rule on punt coverage, for which Noll accepted the blame. “We don’t have a feel for the rule. Maybe that’s because you don’t have a feel for something you don’t like. A month into the strike, no progress had been made in the negotiations while a trickle of veterans were entering the Steelers training camp. 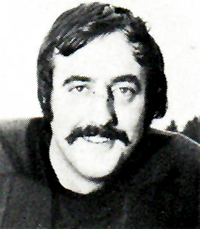 Joe Gilliam had returned with sufficient time to ensure he was the starter in the first exhibition played in New Orleans. Guiding his team to that victory bolstered Gilliam’s opportunity to win the quarterback battle that was certain to be fought out before the start of the season. 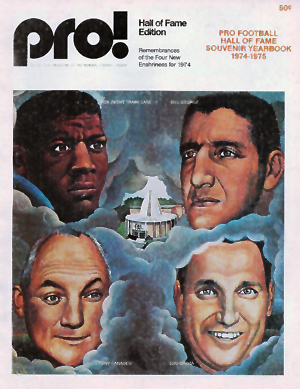 The Steelers were expecting great things for the ’74 season. Having made steady progress under coach Noll since his arrival in Pittsburgh, there were many pundits who now thought the Steelers were certain contenders. Replacing the Same Old Steelers slogan with a more emphatic, “Pittsburgh’s going to the Super Bowl.” The strike had thrown all that zeal into Three Rivers. The season was in the balance while the Steeler veterans gave the illusion of staying solid in their commitment to the strike. The welcomed news spread fast. The gate guard called the switchboard and she rang Nunn. A few minutes later, Bradshaw became the thirteenth veteran to enter camp and was shaking hands with vice president Dan Rooney. With Bradshaw’s return, the vibes throughout training camp swiftly became more positive. “The Blond Bomber’s here,” were the words that spread the news. Without subtlety, one reporter asked Bradshaw if his return to camp was due to Joe Gilliam’s challenge for the quarterback position. “I knew that one was coming,” Bradshaw retorted. “I considered showing up three weeks ago, and again last Tuesday, but I was told to wait a spell, that things in the strike were going to happen." 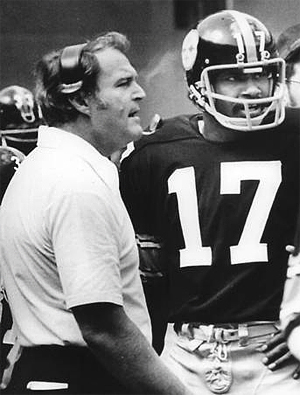 "A quarterback, you know, is in a position where so much is involved,” Bradshaw continued. “I stayed out for the ‘cause’ and out of respect for my teammates, but the big issues now is right here with me. I’m 25 years old and I had a decision to make and have to stick by it. " After Bradshaw entered camp, those Steelers still on strike met that evening to hear their representative, Preston Pearson, reaffirm the union line. “We’re still behind the Players’ Association 100 per cent,” Pearson said. “This let’s everyone in the nation know that we are committed to our cause. We backed down a bit and made the owners counter-proposals. Now let’s see them get serious about this.” Pearson confirmed all the striking Steelers in town had attended. While the Steelers made the playoffs in 1973, before losing to Oakland, they were still coming up short in the receiving department. As a consequent they used their first draft pick of 1974 on Lynn Swann and in the fourth round took out additional insurance with the choice of John Stallworth. Coach Noll wasn’t as definitive as Taylor, but was still enthusiastic. “Stallworth’s a fine football player. He covered on punts Saturday (in the Steelers first exhibition game). He made tackles on punt coverage. He indicates he has not only ability and talent, but toughness too. Gary Robin Pinkel and Curt Randolph Grossman were the tight ends in camp. With John McMakin and Larry Brown on strike, there wasn’t much confidence in the depth of Pittsburgh’s tight ends. Pinkel was realistic when he admitted the reason he signed up with the Steelers was due to his belief that he would have a better chance to make it with them. Whereas Grossman was motivated by the $200 a week he was receiving. Jack Lambert was making sufficient impression in camp to be a likely candidate to make the final squad. While the Steelers were seeing a few veterans returning, in Cleveland, thirteen veterans upped and left camp, leaving just two behind and only 35 players in total in the Browns' camp. Their owner, Art Modell, was in Washington as a member of the NFL Owners negotiating committee and commented that pressure wouldn’t move him. While the national negotiations were going nowhere and some owners were perceived as dragging their heels, the Steelers were looking forward to their Monday Night game in Pittsburgh against the Bears. “I’d embarrass myself because I’d run most of the time,” he added with a smile. Street and Smith’s annual football preview echoed the national enthusiasm for the Steelers chances for the forthcoming season by predicting the Steelers to win the AFC title beating the Dolphins in the championship game before losing to the Cowboys in the Super Bowl. The director of the union, Ed Garvey, described the decision for the call for a return to camp as a tough one. The request had been recommended by the federal mediator W.J. Usery in an effort to inject some life into the stalemate the talks had become. 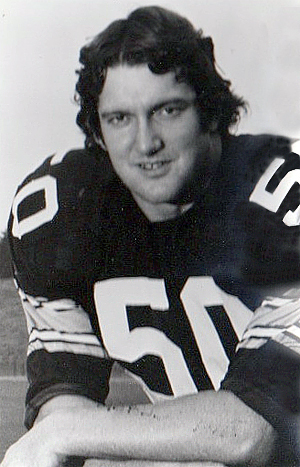 After spending his first week in camp, Bradshaw started the Steelers second exhibition game in Chicago and would have been please with his performance. He put together 10 completions from 14 pass attempts, in addition to scoring a 2-yard touchdown run. Having played for a quarter and a half, Bradshaw gave way to Joe Gilliam, who then took the ball in himself for a score. In the second half, Gilliam followed up with three touchdown passes to put the Steelers on their way to a 50-21 victory over the Bears. Already being described by the PPG as sensational in preseason, John Stallworth was the recipient of a 67 touchdown yard pass. Lynn Swann then collected an 18-yard completion that was followed by a 20-yard touchdown catch to Reggie Garrett. Gilliam finished with figures of 13 completions from 19 attempts for 257 yards and put himself to the front of his competing teammates in the battle to become the Steelers starting quarterback when the regular season began. Frank Nestor’s 31-yard field goal and Billy Joe Roleford’s 5-yard touchdown run completed the scoring for the Steelers as they went 2-0 in preseason. The Steelers also managed to give third string quarterback Leo Gasienica a run out. As the game came to a conclusion, Gasienica took the Steelers 39 yards on seven plays for his a contribution to the 553 yards of Steelers offense. With the suspension of the strike and the arrival in camp of all the veterans, more fuel was added to the quarterback fire with the appearance of Terry Hanratty, who was eager to stake his claim as number one, two or was it now three? “You come to camp confident, that’s the first thing,” Hanratty continued. “You assume you are number one. I don’t come in challenging anyone personally. 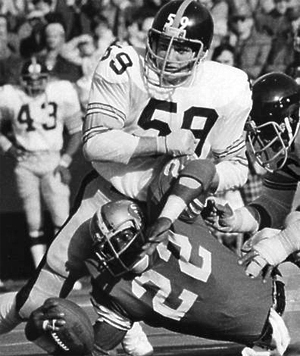 Hanratty had ignored the chance to play in the WFL and signed a new contract with the Steelers in the summer anticipating the prospect of a rewarding road to the Super Bowl. “I knew I did fairly well,” Webster said. “It’s a good thing it wasn’t the Dolphins though. Those Bears weren’t exactly tried and true vets.